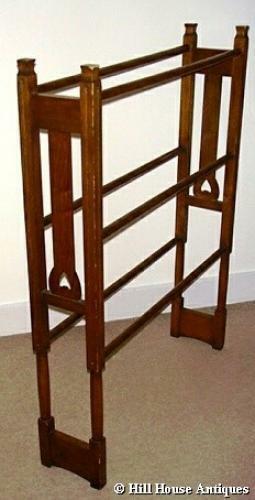 Arts & Crafts Glasgow Style oak clothes horse/towel rail attributed to Wylie & Lochhead c1905. For some reason, these items rarely come onthe market. Coincidentally, we have a matching pair of hall chairs by them - also in same category - check them out. Approx 30" wide, 39" high and 7" deep.